Sun and Sunbeds Are More Alike Than Different. The UV portion of mid-day summer sunlight is made up of about 95% UVA light and 5% UVB light. The majority of tanning lamps in sunbeds emit essentially the same mixture, but with higher intensity, usually 2-3 times more intense. That's why professional tanning salons control the duration of your exposure – short sessions that typically only last a few minutes – based on the UV output of the sunbed and your individual skin type and tanning history. Generally, the higher the intensity of a sunbed, the shorter the session. It's simple math. Your total exposure to the sun or a sunbed is based on the intensity of the UV light multiplied by the total exposure time. So if the sunbed you're using is two times more powerful than sunlight, your Smart Tan Certified tanning professional uses a recommended exposure schedule as a tool to carefully assign your exposure time. Sunbeds with higher intensity generally have shorter exposure times. It's a protocol calculated to deliver three-quarters-or-less of what would induce a sunburn for your skin type. For millions of North Americans, this system is the best way to gradually build a "base tan" which, combined with sunscreen usage outdoors, helps prevent sunburn. Here's what many fail to recognize: The photo-protection of a suntan, in proper combination with sunscreen outdoors, is more protective against sunburn than sunscreen use alone – which is why many practice the responsible usage of sunbeds. Exposure to UV from sunlight or from a sunbed means something different for a fair-skinned red-head than it does for someone of southern European or African descent. It's not one-size-fits-all. Confused? This video explains it simply. Many Dermatologists Use Sunbeds or Recommend Them. Here's an interesting twist: A 2015 survey commissioned by GrassrootsHealth found that 99 percent of dermatologists believe that UV is therapeutic in treating cosmetic skin conditions, 88 percent recommend UV treatment or use their own sunbeds to treat client's cosmetic skin conditions and nearly 30 percent of dermatologists refer clients to tanning salons as an inexpensive means of self-treatment. The dermatology community has lobbied aggressively to increase accessibility to "safe" UV treatments – procedures that often involve higher UV doses than tanning salons deliver – by legislation that would strike insurance co-pays in order to increase phototherapy usage, which is referred to as "safe" in this lobbying context. It's a huge contradiction that underscores the complexity of this issue. In fact, many dermatology offices use higher-intensity sunbeds themselves to treat cosmetic and non-lethal skin conditions like psoriasis. A past president of the American Academy of Dermatology wrote a review of high-intensity UVA phototherapy in the New England Journal of Medicine titled, "UVA1 is Often A1!" Where he wrote of high-intensity UVA sunbeds, "The relative risk for the induction of cutaneous malignancies is unknown." Could dermatology lobbying groups be attacking tanning salons as a competitor, given the fact that they use sunbeds and want to expand their use of sunbeds? But Isn't UV Exposure Harmful? Does UV Research Ask the Right Questions? Here's an important point few people consider: Studies that condemn indoor tanning are not designed to isolate and measure the effects of non-burning UV exposure in a professional sunbed facility. That is the problem. Most research on the risks of UV exposure comes from retrospective survey data (often self-administered surveys) – studies that cannot reliably isolate independent variables, such as assessing whether subjects sunburned repeatedly or exposed themselves responsibly. That limitation, especially as it relates to studies on sunbed use, is becoming more and more important in revealing the need for better study models. For example, a 2006 meta-analysis by the World Health Organization (WHO) alleged that sunbed usage increased the risk of melanoma 75 percent for those who start tanning before age 35. But of the 688 subjects in that meta-analysis, 344 used either home sunlamps or dermatologic sunbeds in a doctor's office – categories that produced the greatest risk. Subsequent meta-analyses of the data have been subject to the same complications – they use the same data sets and self-administered retrospective surveys. 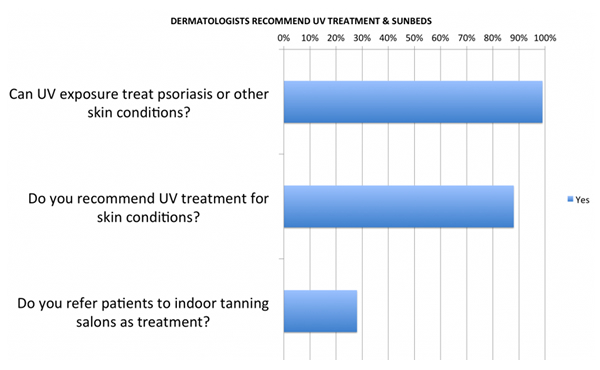 Organizations that have lobbied against sunbed usage have promoted these studies without acknowledging these critical distinctions or the limitations of retrospective surveys. And these limitations are acknowledged in the US Government's own reports. Lushniak: It's difficult to say. We've seen increases [in melanoma cases] – almost a tripling over the last 30 years. And of course, the question is, is it based upon ultraviolet exposure? Increased outdoor activities? The indoor tanning industry and artificial sources of ultraviolet radiation? From our perspective, the real concern is that this is an increase, and we need to do something about it. Washington Post: But we don't know for sure what's causing the increase? Lushniak: In essence, we really don't. From the epidemiological surveillance perspective, we see the numbers increasing. But in terms of looking at specific [causes] of that, it's still difficult to determine." Your Skin Makes Vitamin D from UVB Exposure. Peer-reviewed studies have established that sunbed users as a group have significantly higher vitamin D levels when compared with non-tanners. One Canadian study showed that sunbed users in Canada have the highest vitamin D levels in that country, and that most Canadians are vitamin D deficient. Still other studies have generated similar results. Even though vitamin D production is triggered by UVB exposure, it's important to remember that natural sunlight is mostly UVA – just like most sunbeds. The UV portion of mid-day summer sunlight is made up of about 95% UVA light and 5% UVB light. The majority of tanning lamps in sunbeds emit essentially the same mixture, but with higher intensity, usually 2-3 times more intense. Does that mean you need sun exposure to make vitamin D? That's debated today. While vitamin D is rare in foods and is supplemented into other foods, vitamin D supplements are a viable alternative to those who wish to avoid any risks associated with UV exposure. And, again, professional sunbed centers are not medical facilities – they do not exist to treat vitamin D deficiency. Some anti-sunbed groups and government agencies are questioning whether a sunbed salon should be able to inform their patrons that a sunbed session will produce vitamin D. But shouldn't the salon be obligated to inform their patrons about all of the biological effects of their sunbeds? It is only reasonable that consumers and their doctors should be made aware that sunbed sessions can increase vitamin D levels regardless of what that means to human health. What's the Answer Moving Forward? In 1995, the American Academy of Dermatology lobbied the U.S. Food and Drug Administration to ban indoor tanning completely, based on a statistic pulled from a small subgroup of one 1994 study. That statistic was promoted for several years, appearing in press reports about tanning despite being debunked by FDA as not truly representing the study's data and is no longer used today. That statistic – that 10 sunbed sessions increased melanoma risk seven-fold – lacked rigor from the start (its data set also suggested that sunscreen usage doubled melanoma risk, a finding that was divergent and was obviously never publicized), but affected policy and debate for almost five years (Page 7 of this link). In 1996, the American Academy of Dermatology presented research at its annual media day that claimed by 2012, melanoma would be the leading cause of cancer mortality in people of all skin types. That never came close to being true – in fact, melanoma mortality has decreased steadily in women since 1985, while increasing in men, according to the National Cancer Institute's own data. Again, the data fueling this claim were never evaluated. In 2002, dermatology leaders promoted a study they claimed involved tanning salon sunbeds, despite the fact that most of the data came from usage of sunlamps in homes by fair-skinned people (95% of the data set) in the 1970s before tanning salons existed. This study is still cited today, despite the fact that its authors acknowledged in the text that results "did not achieve statistical significance." Yet again, this study went unchallenged, and fueled many policy decisions. In 2009, dermatology leaders claimed sunbed usage before age 35 increased melanoma risk 75%, despite the fact that half of the subjects in the data set were using either medical phototherapy units or home tanning sunlamps. When data from tanning salon sunbeds was broken out, the risk became statistically insignificant. This statistic has since been discredited as not applying to tanning salons and removed from the CDC's website, but resulting regulations remain in effect. Sunscreen manufacturers and The Skin Cancer Foundation have called for daily use of sunscreen products year-round to block ALL UV exposure, which vitamin D experts say may be harmful. Smart Tan supports the development of consensus methodology in this field, in order to ensure that the quality of research is evaluated objectively and that thoroughly conducted studies are given proper consideration. With this knowledge in hand, stakeholders (including policymakers, legislators, regulators, clinicians, and public and commercial entities) will be better able to evaluate the utility of research methods regarding UV exposure and human health. What is a "Smart Tan?" The Golden Rule of Smart Tanning – taught to every Smart Tan member salon – is "Don't EVER sunburn." Exposure to UV from sunlight or from a sunbed means something different for a fair-skinned red-head than it does for someone of southern European or African descent. It's not one-size-fits-all. Notice: You do not need to become tan for your skin to make vitamin D. Exposure to ultraviolet radiation may increase the risk of skin cancer and can cause serious eye injury to unprotected eyes. © copyright 2019. all rights reserved. terms & conditions.